While those utilitarian features are quite useful in a laptop, this controller chip both controls a CD drive and can implement advanced password protection. Controlling a notebook's CD drive the most revolutionary feature of this chip. Now you can listen to tunes, on your laptop, without having the computer running. The on-board hardware random number generator (RNG), when used with the right software loaded into its firmware, can create a secure login that is virtually impossible to crack. Security software can also be used to test the integrity of the BIOS as well. (BIOS is the software that runs your computer underneath the operating system.) You will no longer have to worry if your BIOS software was damaged by a virus or even a hardware failure, thereby increasing your system reliability. In addition to being able to measure the CPU temperature with a single diode, the National PC87591 directly measures the ambient temperature and system voltages. Monitoring the health of the laptop this way helps maximize performance under severe heat. Since processor can be run faster, the laptop performance is increased. 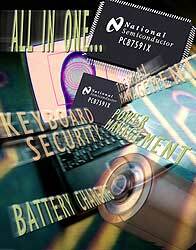 The NSC PC87591 sounds like a great chip packed with useful features. National has even figured out how to pack in all these features, while lowering the cost of this controller as well. I can hardly wait to see the first laptop that utilizes these enhanced features.